Grant Nelson in action for Edusport Academy. Caley Thistle manager John Robertson is running the rule over former Rangers midfielder Grant Nelson. 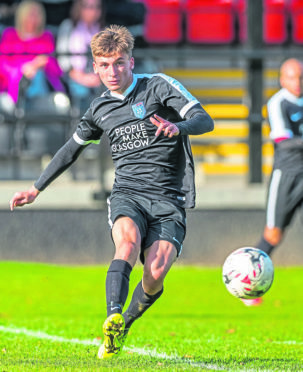 The 19-year-old has joined up with the Inverness squad for pre-season training and played in Saturday’s 5-0 friendly victory against Strathspey Thistle at Fort George. Nelson is a free agent after leaving the Ibrox club this summer following a serious ankle injury, and Robertson is keen to assess the teenager further. He added: “He’s been recommended to us as a box-to-box midfield player. He has been up with us and done all of pre-season so far. “He’s a young lad who it looked like big things were going to happen for, but he picked up a bad injury when he broke and dislocated his ankle. “He has battled back well and he has looked sharp in training so we will see how he gets on. Robertson oversaw a separate squad that also triumphed 5-0 against Keith at Kynoch Park and he was encouraged by his side’s return to action. He added: “Everyone drifted in and out of the game at some stage. “The heat was incredible and the fitness levels are going to drop at some stage. But they showed more than enough of what they are capable of. Robertson oversaw the trip to Keith, with the Championship side taking the lead on 20 minutes when Tom Walsh’s corner found Charlie Trafford at the far post and the Canadian midfielder bundled the ball home from close range. Inverness doubled their advantage six minutes later when winger Zak Elbouzedi latched on to a long ball before firing into the roof of the net past goalkeeper Greg Simpson from 15 yards. An outstanding save by Simpson to tip Walsh’s long-range strike on to the crossbar denied Caley Jags a third goal on 34 minutes. Elbouzedi also rattled the woodwork with an effort from a similar distance on 70 minutes. The third goal arrived on 74 minutes when young right-back Donald Morrison clipped a deft shot past Simpson before Nathan Austin made it 4-0 from the penalty spot six minutes later after he had been tripped by Maroons defender Bradley Manson. Irishman Elbouzedi rounded off the scoring in style with a strike that beat Simpson at his near post. At Fort George, Scott Kellacher was in charge of the side that won 5-0 against Strathspey, with teenager Daniel Mackay netting a hat-trick, while George Oakley and Liam Polworth also scored. Inverness will once again split their squad tomorrow, with Robertson taking charge of the side that will face Rothes at Mackessack Park, while Kellacher will be in the dugout for a trip to Forres Mechanics.